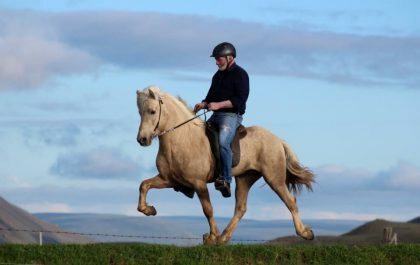 On this tour, we offer a small group of horse-lovers the unique chance to visit family-operated and professional breeding farms in beautiful North-West Iceland! We visit our friends and neighbours, for example the internationally reknowned farms Hof and Steinnes, and gain personal insight into their training and breeding methods. 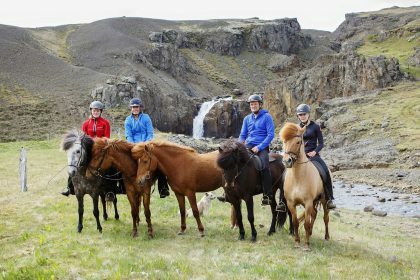 Experience their typical icelandic hospitality and take part in fruitful discussion around the icelandic horse! We will of course not only show you Iceland’s horses, but also its extraordinary nature, its surprisingly delicious cuisine, and the only true way of relaxing and warming up after spending the whole day outside: in an icelandic hot pot with naturally warm water. 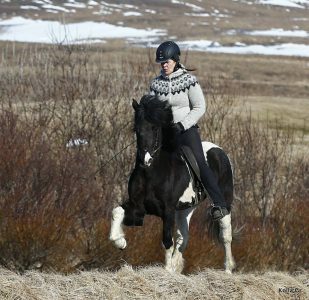 A visit to Iceland’s biggest „horsevillage“ is also planned, where the owner of famous stallion Eldjárn frá Tjaldhólum is expecting us. One thing is for certain: this will be a very exciting trip! Pick up at the airport between 15:00 and 16:30 or around 17:30 in Reykjavík. Transfer to guesthouse and horsefarm Brekkulækur in Northwest Iceland and dinner there. On the way, we will pass through the beautiful region of Borgafjörður and a 3000 year old lava field. On our program for the next days are the breeding farms Steinnes, Hof, Bessastaðir, Syðri Vellir, Grafarkot and Gauksmýri; the horsevillage in Hvammstangi, where we will meet the horses and humans of Stóra-Ásgeirsá. You can expect to meet beautiful horses, interesting people and to have inspiring discussions around our shared passion for the Icelandic horse during these days! 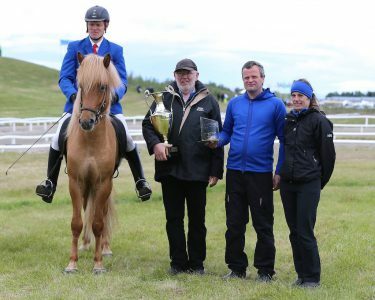 Additionally, we will visit the local swimming pool, enjoy traditional icelandic food and on one evening, the farms will perform a horseshow for us. After breakfast, we will journey back to Reykjavík, where we visit one of the many the horsevillages. 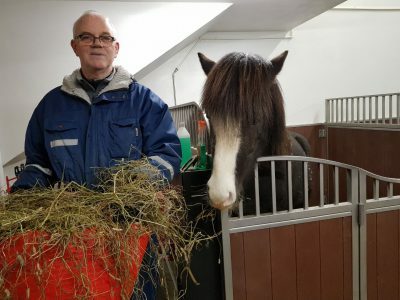 Snorri of Topphross is expecting us in his modern stable and will show us around. We will spend the night in a nice guesthouse in Keflavík. Transfer to Keflavík and goodbye to Iceland.